Using a J ( 6mm) crochet hook, chain 60 to start doll blanket. Following the wavy ripple stitch pattern by working a double crochet (DC) in the 3rd stitch from hook (counts as 1st DC). Ch 3 and turn at the end of each row. 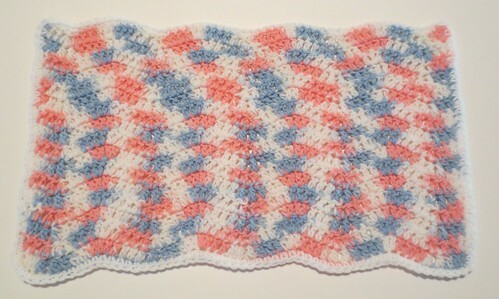 Repeat the ripple stitch pattern until you complete 16 rows. 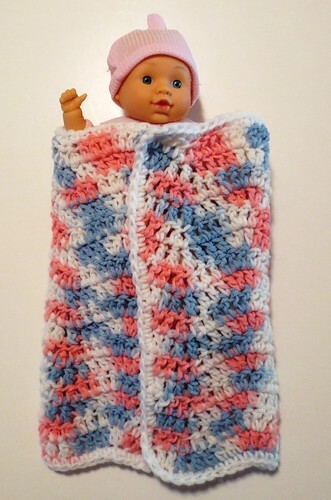 I then single crocheted (SC) around entire blanket using white yarn. Future explanation of rows: Each row begins with a Ch-3 and turn (counts as 1st DC). Then DC in the next two stitches, 2DC tog (together), 2DC tog, DC in each of the next 3 stitches, 2 DC in each of the next 2 stitches, then DC in each of the next 3 stitches. Repeat. ****Please do not copy my patterns on your blog site or post my patterns on Internet sites. I do not allow my content to be republished without expressed written permission. Posting of my patterns and blog articles, without written permission is in violation of my copyrights and is content theft. @Lara – I did a blanket 44 inches wide by chaining 145 for base row. Double crochet (DC) in the 3rd stitch from hook (counts as 1st DC). Then work a DC in each of the next two stitches.Then follow the pattern until it is long enough for your throw. Would this be wide enough? Let me know if this will work or I would be happy to help you further.